This need for emotional destruction in Lucifer isn’t even a call for the show to be less fun or funny. Because at this point, any Lucifer episode can be funny in its sleep, based on the sheer will of the cast alone; the day an episode of Lucifer lacks any sense of humor will be a sad day for the series. But Lucifer’s ability to do a balancing act between its weird sense of humor and its surprisingly human sense of emotion has been its greatest strength these days, and it’s the sign of any good or even episode of the series. Lucifer has progressively realized how to work as a procedural (which I must always mention is not inherently bad) with a twist, and this season and now this three-parter have been the biggest proof of that. “A Good Day To Die” has the necessary emotional weight in spades, all while managing to find the humor in situations like its main character killing himself to save his partner or a murderous drug smuggler throwing a party every day until his court date. Lucifer knows when to laugh, it knows when to get serious, and it knows when to turn something serious into a laugh. This episode is proof of that. And it’s not just the culmination of a three-part story: The episode is the turning point for quite a few of the show’s characters, especially when it comes to redemption. Keeping things moving from last week’s conclusion, Chloe’s in rough shape after being poisoned, which is honestly par for the course in a season where the detective’s dealt with a major car crash, confronting the man who killed her father, and almost being blown up. But Lucifer knows the character well enough to acknowledge early on that she’ll stay in the field with Lucifer until she physically can’t. It also knows that the detective, procedural work of going to Bert and then to terrible artist/criminal Dave Maddox, while fun in its own ways here, is only a pit stop (that at least provides the ingredients for the antidote) on the way to the obvious and more fascinating decision to have Lucifer go back to Hell to save the day. Obviously, the hook for this finale is the concept of Lucifer willingly going back to Hell. Last week’s episode officially introduced the concept of a mystery poison with an even more mysterious antidote, one that only Professor Carlisle (Tim DeKay) knew the formula to. Of course, the episode also had Carlisle slit his throat, taking the formula with him in his death, giving the audience a bit of a plot contrivance, and forcing the characters’ hands to take things to the next level. You do what you’ve got to do to drive a plot along—even if it features a seemingly magic poison—and that’s what happens here. It’s a plot point that ultimately drives the rest of the show to interesting places, after all. Plus, as I noted in last week’s episode, Lucifer had to kill Carlisle before he could overstay his welcome, even though he still exists in the afterlife. Lucifer going back to Hell is a no-brainer, as well as a big way to end a big trilogy. And since season one put Lucifer in the position of not being able to just go back and forth between Hell and Earth, the show gives the audience the gift of a “celestial planning session” to figure out how to get around that, as well as the interesting choice of killing Lucifer, even if it’s just supposed to be for a minute. In another round of good Lucifer choices, Lucifer’s Hell interaction with Professor Carlisle is an easy one. 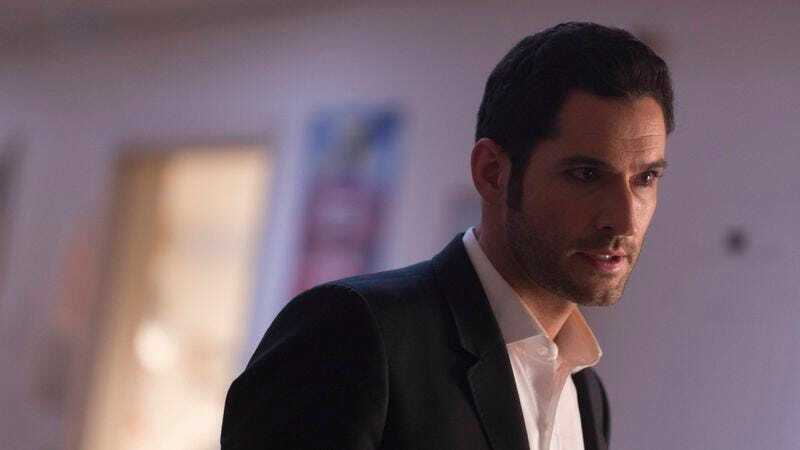 After the dramatic way Carlisle killed himself (after poisoning Chloe), you’d think Lucifer would have to struggle to get the antidote from him. It’s not like he could appeal to the goodness in the man’s heart. At the same time, if there’s one thing Lucifer and Lucifer know, it’s Hell. So while Carlisle spent all his time on Earth attempting to rationalize his thought process and “explain” how he could possibly be in the right in his selfish, sociopathic decision-making, when forced to actually face his choices as punishment, he crumbles. His was not a righteous cause, no matter how much he tried to pretend it was when he was on Earth. In his heart of hearts, he knows that. And Hell knows that too as it creates the “torture of [his] own making”: the same original car wreck scenario that ruined his life, followed by non-stop derision from the general public for his selfish choice. There’s no struggle left in Carlisle. Think about it this way: Charlotte speaks so passionately about how much she hated being in Hell, and for the audience, that comes with the knowledge that the woman was somehow strong enough to not even be broken by Maze in all her time down there. But Carlisle? As evil as he was, he’s just another weak human who cracks under the pressure. And will continue to crack under the pressure for the rest of his afterlife. None of this prepares Lucifer for finding himself stuck in his own personal Hell though, a place that looks like Lux and forces him to kill his brother Uriel (Michael Imperioli) again. And again. And again. In Hell, there are no distractions, and as such, Lucifer is brought face to face with his own guilt about killing Uriel. He’s is unable to stop, constantly attempting to explain that he had no choice in the matter but not necessarily believing it himself. Why is there a door to Lucifer’s own Hell in the first place? While there are still plenty of questions to be asked about Hell as a whole here, Charlotte points out that while Lucifer was the “lord of Hell” that’s not exactly the case anymore. He did abdicate his throne, and though we don’t know who is running things down there right now—if anyone is—this episode confirms that it’s certainly not Lucifer. There may not even be a replacement for him as things stands right now, but there’s still nothing stopping Lucifer from being just another prisoner. So in a sense, Charlotte is right to worry about Lucifer returning to Hell—it’s just difficult to side with her given everything she does on a weekly episodic basis. But even that’s not necessarily true by the end of this episode. Everything builds in “A Good Day To Die,” and it’s never quite clear until the end if that’s a good thing or if it’s all building up to a fall. As Lucifer winds up stuck in Hell, Maze doesn’t know how to handle it, Dr. Linda is one moment away from killing herself to save him, Chloe is still dying, Amenadiel is beating up hospital workers—everything’s going to chaos. That is, until Charlotte finally proves herself as the mother she’s always claimed to be. Lucifer is able to break the chain of his own personal Hell as a result of Charlotte explaining how she is to blame for all of this. Yes, Charlotte takes the blame and responsibility for once, acknowledging that her single-minded need to return home and get revenge on her ex-husband has done irreparable harm to the family she claims to love. And Lucifer also remembers the simple fact that, unlike Carlisle, he really had no other choice but to kill his brother: Lucifer killed Uriel to protect Chloe and Charlotte, as Uriel was fully prepared to kill both of them. Unsurprisingly, Tom Ellis yet again makes already good scenes on paper come across as excellent. The sheer despair and heartbreak he displays as Lucifer is forced to keep plunging the blade into the cold manifestation of his guilt (that just so happens to look a lot like his brother) is only the appetizer for his later breakdown outside the hospital. Keep in mind that this is all the aftermath of an especially confident Lucifer planning the Hell trip in the first place. 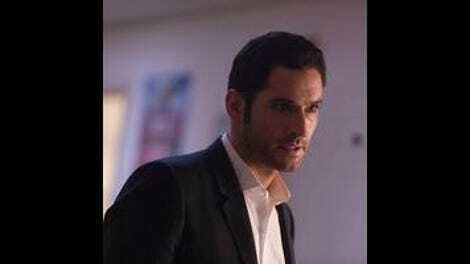 But Lucifer is never just one thing, and Ellis remains game when it comes time to play any version of this character. Tricia Helfer also comes to play in this episode, as she’s allowed to play Charlotte at what is perhaps her realest and most vulnerable. Because while it’s easy for Charlotte to say she’s doing everything for her family while she simultaneously manipulates her way back home, it’s not until this episode that she finally puts her money where her mouth is, killing herself (well, letting Maze kill her) to go back to a place she loathes more than Earth and saving her son with nothing but the genuine truth. I’ve never thought Charlotte’s love for her children was a front, but her superiority complex, one-track mind, and absolute disdain for humanity have clearly gotten in the way, making her the villain in a story where she could have easily been a hero. So here, Charlotte finally redeems herself, putting her family first, even when it’s almost to her detriment in Hell. She proves that unconditional love she always talks about isn’t just lip service. She’s making grand speeches (that get humorously interrupted by her rival), she’s admitting her mistakes and guilt, and she’s honestly willing to stay in Hell with what she knows to be a fake version of one of her children. She’s being the best damn mother she can possibly be, and Tricia Helfer sells the love and the pain of it all. Unfortunately, it’s all too little, too late. After all these episodes of Lucifer forgiving her while she keeps manipulating him (this latest being the faked support of Lucifer’s relationship with Chloe), the divine intervention reveal from last week truly was the breaking point. So even though this episode finally makes the supportive mother thing more than an act and Charlotte takes the blame for all of the chaos that’s happened since she arrived, it couldn’t have come at a worse time. Just because things had to be paused due to Chloe’s poisoning doesn’t mean Lucifer forgot about the divine, paternal intervention that put Chloe in his path. It’s still one of Lucifer’s biggest questions as to what that really means, but as this episode ends with Lucifer skipping town, it’s obvious that Lucifer has some questions of his own too. Charlotte finally admits to Lucifer that his father’s manipulation doesn’t change what’s real between Lucifer and Chloe, but why should Lucifer believe her anymore, even when she’s telling the truth? It’s great to see Charlotte get right, but she certainly could have better timing. Not even cheesy noodles can fix this. Getting the gang to work together for a common goal is the right way to end this trilogy, and it’s even more interesting to see when you really look at all of this has evolved. Of course the Lucifer/Chloe relationship is at the center, but there are still so many other relationship dynamics that are at work throughout this episode. Charlotte still can’t wrap her head around the importance of any human, so she’s the only one who opposes Lucifer’s dying and going back to Hell plan. Maze can’t do the one thing she’s wanted to do all season—kill Lucifer, if only for a minute—because he really is her best friend, and you don’t kill your best friend. Amenadiel is understandably annoyed that Dr. Linda knows the truth about him, his family, and Maze… which just so happens to be a fact everyone else in the inner circle knew but him. Dan is willing to follow Ella into the seedy criminal underbelly of “cat burglary” to help save Chloe’s life. One more thing: Lucifer isn’t really a music montage type of show, but I’d say it certainly earns the use of the device in this episode. There’s something so visceral about Lucifer having to physically remove Charlotte from “Uriel” as the X Ambassadors song kicks in. The same sentiment goes for Maze’s inability to function as she realizes Lucifer’s not coming back to life. Or when Amenadiel makes good on his promise to his brother not to let anyone move Chloe (and on his sort of promise to Trixie to be one of the good people in this world). It’s a bit melodramatic, but its emotional manipulation that works extremely well. These characters have been through a lot so far this season. It’s understandable for them to struggle under the weight of it all, and this montage and episode capture that. “A Good Day To Die” is the perfect conclusion to a three-part story that has been building to something special even during its more ridiculous moments. (See: The interrogation of Lucifer’s past lovers.) It’s not all wrapped in a neat little bow—and the actual end of the season may not be that way either—but as far as the story it tells goes, it’s Lucifer at its best. The montage is set to X Ambassadors’ “Unsteady,” and I believe it’s the Erich Lee Gravity Remix. In addition to being an excellent musical choice for the scene, making an already emotionally affecting scene fully come together, I got a kick out of it on a personal level. X Ambassadors have been one of my favorite bands since before they were even called X Ambassadors, so the combination of them and a stellar Lucifer really got me. You’ve got to appreciate that Lucifer still treats his team-ups with Dan as Detective Douche lessons. Sorry Dan had to get beaten up because of that, but at least Lucifer put an end to it once he realized it wasn’t some elaborate plan of Dan’s (who told him to follow his lead). Alright, time to brainstorm: Why is Dr. Linda so sure her death would send her to Hell? I knew Ella had to be telling the truth in “Lady Parts” when she said she used to steal cars, but the reminder in this episode (as well as the matter of fact tone in which she tells Dan) is delightful, for lack of a better term for that sort of thing. However, how could she pass a police background check with that past? She tells everyone about it. Meanwhile, Ella’s brother Ricardo (Albert Nicholas) is still in the family business. I assume it’s a family business because Ella also learned how to pick locks from her grandmother. As sad as it is for Chloe to find out Lucifer skipped town the way she does, I’d say she gets off lucky simply by being the first person to realize it. I can only imagine how everyone else will react, since they went through all this trouble to save him and Chloe, only for him to disappear. I’m interested to see how they handle Amenadiel the rest of the season. We know he wants to go home, but we also know he wants to be and do good. I feel like his heart-to-heart with Trixie has awakened something in him, since he hasn’t had much of a purpose since falling from grace. An angel in Los Angeles on a path of redemption? That could work. When he’s with Carlisle, Lucifer makes an interesting point (which opens a whole other round of questions) about how a person’s Hell can be escaped if they no longer truly believe they deserve it. The thing is: If you’re in Hell, you probably really deserve it. Uriel’s final words to Lucifer were apparently “the peace is here” or “the piece is here.” (Closed captioning is not perfect. )w That still doesn’t tell us much, but one assumes the final part of the season will explain it. This is the last new episode until May, so I guess I’ll see you all when Lucifer returns. Hopefully none of us have nightmares of this episode’s terrible clown paintings during the wait.